Just a quick and rather slack post this Sunday evening... big lovely day of adventures and now we're all pooped. So, focussing on the gorgeous work of others who have sent me their beautiful blessingway squares. These will be pinned to some fabric on the wall over the next week and added to a quilt at a later date. Aren't they just amazing? I love how everyone's work is so completely different. The square at the top left is by my friend Amy. 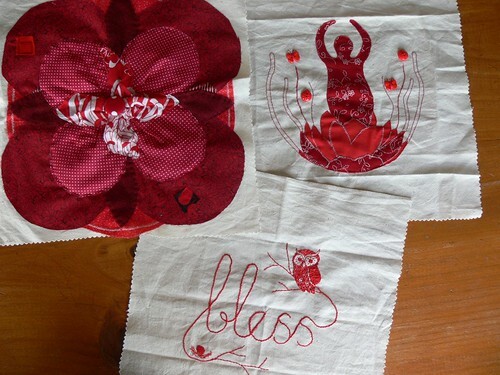 We received a beautiful pair of her bootees too :) Then there's Katie's beautiful hand stitched goddess and Bec's beautiful Bless square, complete with mama owl and nest... Blessed indeed! Mine's coming - I promise!!! They're so great! I especially love the owl and nest! So beautiful and special! How lovely to have such (handmade) reminders of the blessings of friends for you and your family as the littlest one's arrival draws near.